Are you a fan of the great British roast dinner? The people at Toby Carvery are passionate about their food, serving up delicious slow-cooked meats with all the trimmings – along with breakfasts and some pub classics - at their family-friendly restaurants across the UK. You can enjoy a great meal out for less with Toby Carvery vouchers – whether it's just a quick bite or a full 3 course meal, Toby Carvery offers represent fantastic value for money. Toby Carvery restaurants are famous throughout the UK for offering delicious food at amazing prices in a relaxed, family friendly environment. In business for over 30 years, the chain operates 150 restaurants around the country and serves up something in the region of 21 million meals every year. Although the focus of the chain is on roast dinners (their slogan is 'Home of the Roast'), Toby Carvery restaurants also offer a great value breakfast menu, with an all-you-can-eat option, vegetarian alternatives and more. They also serve classics like Bangers and Mash and Cheese Ploughman's from an extensive Pub Menu, tempting puddings and more. The roasts which they are famous for are served up 7 days a week and offer a great alternative to cooking at home for modern families. With a choice between beef, pork, turkey and honey-and-mustard-glazed gammon, the roasts are accompanied by all the trimmings including roast and mashed potatoes, Yorkshire puddings and a wide selection of fresh vegetables. Toby Carveries also offer an extensive drinks menu, with low-priced beers, ciders, wines and spirits available for customers to enjoy. Feeling hungry and want to sample some of Toby Carvery's delicious cuisine? With Toby Carvery vouchers you can make great savings on eating out. Whether you just don't want the hassle of cooking a family roast at home or you want to relax and enjoy a fun night out with friends, a Toby Carvery voucher means you can treat yourself to a fantastic meal out for less. Over 21 million meals served every year. Visit our website to find a Toby Carvery offer that suits you. Download and print your Toby Carvery voucher. As you can see, saving at Toby Carvery is simple to do, it’s free, and only takes seconds. So remember that the next time you’re on your way to Toby Carvery! Ever wonder what goes on behind the scenes at a Toby Carvery? Now you can find out thanks to the company's Youtube channel. Check out what's happening at Chef School, learn more about the perfect roast dinner and access original content. You can also find out more about the latest Toby Carvery vouchers and how you can save money on great meals out. The Breakfast Menu features a great value for money 'all you can eat' breakfast with sausages, bacon, toast, baked beans, tomatoes, free range fried eggs, potato and cheese hash and potatos rostis, as well as a range of vegetarian and lighter options. The Pub Menu offers a wide selection of classic dishes such as bangers and mash, lasagna and a choice of baps and baguettes, while the Puddings Menu has a selection of tempting dishes to round off your meal such as the Chocolate Brownie Ice Cream Sensation and the Lemon Cheesecake Sundae. There are also a selection of vegetarian options available, with filling and delicious dishes like Nut Roast Wellington and Vegetable Shepherd's Pie available for those who don't eat meat. Category Food & Drinks offers you a wide selection of coupons and rabates. If you haven't found any vouchers for Frankie and Bennys, check out the bargains at Harvester, Pizza Hut. 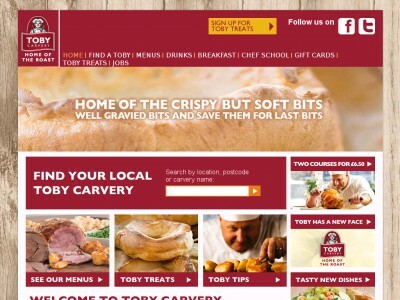 Visit the Toby Carvery website to find a restaurant near you. Download and print out your Toby Carvery discount vouchers. Take it along to your nearest restaurant and enjoy your meal. Don't forget to tell the staff that you will be using your Toby Carvery vouchers when you order! Need to speak to the team at Toby Carvery? Whether you want to make an enquiry about booking a table for a large party, want to know more about the food available or just want to find out more about making big savings on delicious food with Toby Carvery vouchers, you can contact your nearest Toby Carvery by using the search tool here. Want to stay up to date with all the latest happenings at a Toby Carvery restaurant near you? Why not follow Toby Carvery on your favourite social media network? The company maintains a presence across all the major social media platforms, keeping customers informed of any news from their local Toby Carvery, advertising opportunities to join the team and giving the low-down on the latest Toby Carvery offers so that you can make great savings on eating out. Don’t forget to check them regularly, as you can never be sure when free Toby Carvery voucher codes might be waiting for you! Buy now online at www.tobycarvery.co.uk/. Toby Carvery (Tobycarvery.co.uk) is hands down one of my favorite restaurants that I regularly visit, and whenever I do I always have Toby Carvery vouchers on hand! Not only can I eat more for less with a Toby Carvery voucher, but I can discount the entire meal when I’m out eating with friends or family. They are free to use, require nothing to use, and allow you to taste delicious roast dinners at the lowest price possible. Be sure you redeem your Toby Carvery vouchers to take advantage of all the great food Toby Carvery offers at discount prices!